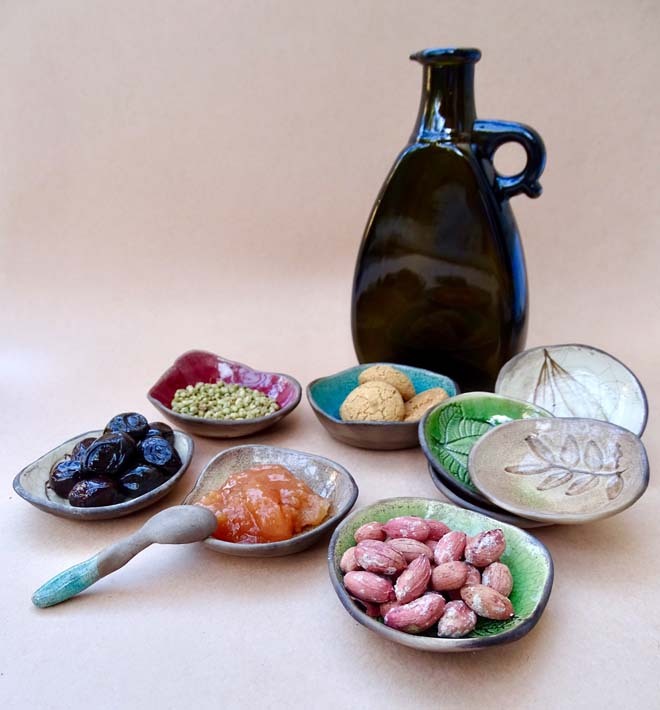 A limited edition set of 5 uniquely handshaped small dishes and 1 spoon from Serap Yurdaer's In the Rhythm of Nature collection. Only available while stock lasts! The designs are imprints of Aegean plants – mastic, pink pepper, olive and fig tree leaves. No imprint on the turquoise dish. Each dish has a unique shape and is Raku fired and food safe (lead-free). Serap Yurdaer Ceramics offer free shipping as standard via regular untracked mail (up to 30 days depending on the destination). When returning items, please send via registered mail. The parcel remains the customer’s responsibility until it reaches us. Returns postage will only be refunded if the product is faulty or damaged. Exclusive 10% discount for Cornucopia subscribers.